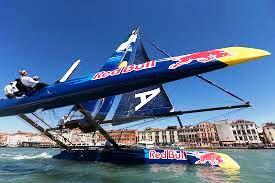 As an avid fan of catamaran racing and a sailor I have never understood why it isn't a more popular sport? I tell people I race them, some look at me as if I have started speaking a foreign language. 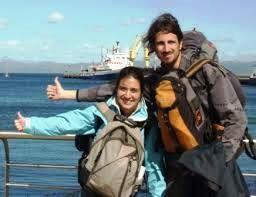 Others ask every question imaginable usual ending the conversation with wow that sounds exciting. Doesn't it scare you? The honest answer is yes - most of the time, but isn't that why we take up these sports, to be exhilarated and scared at the same time? I love that feeling I get, when my heart is beating in my throat and the adrenaline is pumping, hoping for a little more speed. Catamaran racing as you can probably guess is a long way from the leisurely images you may have in your head, casually sitting on a beautifully crafted yacht on the deep blue sea, gliding through the waves, with the wind in your hair and a gin and tonic in your hand. 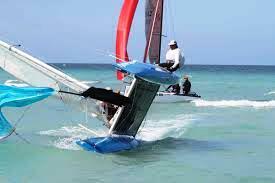 If you want to race a catamaran be prepared to get very wet! 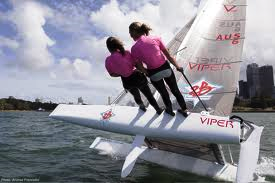 What is a Catamaran Racing? For those of you who are unsure what a catamaran is and how it differs to any other sailing boat, the main difference with a cat is it has two identically sized hulls as opposed to one, hence them also being known as multi-hulls not mono-hulls. 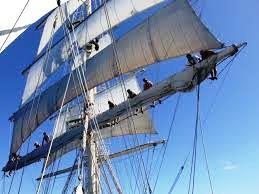 The hulls run parallel and are joined by two cross beams, one halfway down the boat on which the mast and sail is mounted, the second at the back of the boat. The square area created between the hulls and cross beams creates an area for the fabric deck known as a trampoline, although it sounds and looks similar to a gymnastic trampoline you won't get much height jumping on it (more likely you will put a hole in it). 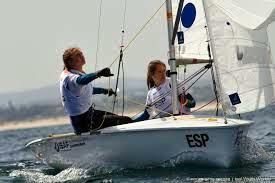 Catamarans generally have two sails - the main sail and the jib, others have a third sail known as the Gennaker (this is a cross between a Genoa and a spinnaker) and is primarily only used on racing boats. 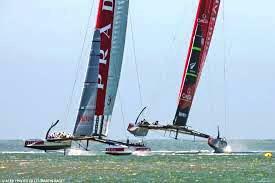 The largest of the catamaran racing boats are those that take part in the Americas Cup, these boats measure between 14 and 22 meters in length and can reach speeds of up to 45 knots (51 mph) and carry a crew of 11. The Americas Cup more recently hit news headlines due to the tragic death of English Sailor Andrew Simpson whilst training in San Francisco and although good publicity for the sport is a great loss to the sailing fraternity. The Americas cups boats are not the kind of Cats in this article, I am writing about the smaller, more user friendly boats that are accessible to people who have a limited budget to spend on a new and exciting hobby, (as long as they like the sea & getting wet). 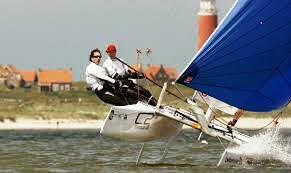 The majority of the small catamaran racing boats are between 4 meters and 6.5 meters in length, a second hand one can be an in-expensive purchase from around $800 or £500 for a boat that is definitely good enough to get you out on the water. If you have ever watched a mono-hull boat sailing along at any speed, you will have seen it leans over to about 45 degrees. This same thing happens on these sailboats, the only difference is as the boat starts to tilt, one of the hulls rises out of the water until it is beautifully balanced on just one hull. This takes a lot of skill to master, the art of flying a hull without capsizing, the technical term for when the boat falls over. When the boat is flying a hull it is sometimes necessary for the crew to help balance the boat to enable you to get more speed, this is done by the crew standing on the side of the boat leaning backwards at between 45 and 90 degrees to the hull, whilst hanging from the trapeze wire in a harness, a wire that comes from the top of the mast. The more the hull rises out the water the more vertical you stand - this can sometimes be an unnerving place to be when flying a hull at its maximum height whilst bouncing over the waves, a picture that I'm sure to most may seem totally inconceivable if you are not acquainted with the sport, and are now starting to think that I may have got sailing mixed up with the circus somewhere along the way. 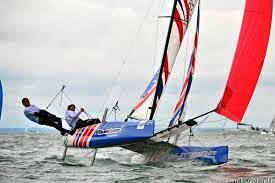 The question is why Catamaran racing? Imagine this... you are sitting on one of the hulls, the sails are all perfectly trimmed as the boat slowly glides through the waves, the sun is shining and it's a glorious day. Then the wind starts to pick up you tighten the sails, the hull starts to rise out of the water, your heart starts to beat faster, you ease yourself out onto the trapeze wire as the hull flies ever higher. You're now standing almost vertical on the side of the hull, the boat is now gliding along cutting through the waves at a rate of knots, the boat is angled at 45 degrees and leaving in its trail a visible track of turbulence in its wake. The only question now should be, Why Not?